I'm not really in the mood for posting today ... not sure why, things are a bit weird in my head right now. I'm kind of hiding I guess. Nothing exciting happened last night. Got home after 8pm, enjoyed a relaxing bath, had a cereal supper and watched some Grey's Anatomy Season 3. 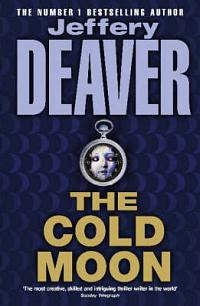 But I do have a book to review ... so here I am bashing away at my keyboard to provide you, the reader, with Jeffery Deaver's The Cold Moon. It's the night of the full Cold Moon - the month of December according to the lunar calendar. A young man is found dead in lower Manhattan, the first in a series of victims of a man calling himself the Watchmaker. This killer?s obsession with time drives him to plan the murders with the precision of fine timepieces, and the victims die prolonged deaths while an eerie clock ticks away their last minutes on earth. Now, let's just keep our heads down and hope today is an improvement on yesterday and that I manage to get to Yoga tonight.